Australian captain Ricky Ponting, fast bowler Mitchell Johnson and all-rounder Shane Watson are to be rested for the three-match One-Day International series against India which gets underway on 17th October. Michael Clarke will assume captaincy duties and there is a recall following a knee injury for batsman Callum Ferguson as Australia named a 14-man squad for the series, which also includes matches in Visakhapatnam and Margao. “Player workload management is particularly important over the course of the next seven months as we prepare a squad to defend the ICC Cricket World Cup in India and the subcontinent and to win the Ashes back from England," National Selection Panel (NSP) chairman Andrew Hilditch said. “Each individual player has a program developed in collaboration between the player, the coaching and conditioning staff and the NSP, which will get each player to the end of April 2011 in the best possible physical condition and, we hope, with plenty of Australian success on the field. 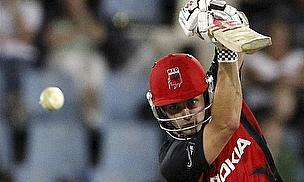 “With that in mind, Ricky Ponting will not take part in this one-day series. The NSP has decided as part of the ongoing management of Ricky’s workload he should not take part in this series. The demands of back-to-back Test matches in tough Indian conditions have been taken into consideration. “In addition, Ricky faces a very demanding domestic summer on his return to Australia and will have no other opportunity for a break from the start of the domestic season until after the much-awaited ICC Cricket World Cup in India and the subcontinent, which begins in February next year. “Mitchell Johnson will also have his workload managed and not take part in the series. As Mitchell is now the leader of our bowling attack, and with numerous injuries to our fast bowling stocks at present, it is essential we manage his workload so he can get through the domestic summer and the ICC Cricket World Cup. Two uncapped fast bowlers - James Pattinson and Mitchell Starc - also join the squad while opener David Warner also returns to the ODI squad and is likely to replace Watson at the top of the order. “Both Brad Haddin and Peter Siddle are making extremely good progress in their returns from injury and will resume playing state cricket while this one-day squad is in India. It was felt premature for them to return to international cricket for this series and they are expected to build workload through the beginning of the interstate season.